Take That Flag and Shove It! I wrote just over 2,000 words yesterday and I’ll be honest, it was relatively easy. Don’t get me wrong, it was still the, I have to force myself not to fart around on social media kind of hard, but the words came easy. And as I danced around happily while sticking a SILVER star on my March calendar, a piece of me still couldn’t be happy, in between dancing, because, obviously I can do this 2,000 word a day thing when I want to. Right? But then I reminded myself where I am in the manuscript. I’m over 50,000 words into the draft and I’m a detailed drafter, not a slap it on and fix it later kind of a girl. At this point, characters have started to become familiar, the world has good definition and there is a light at the end of the tunnel akin to spring after a long, cold winter. I want to get there. I have a beginning, a middle and by golly I want and end. I don’t even care how messy that end might be. 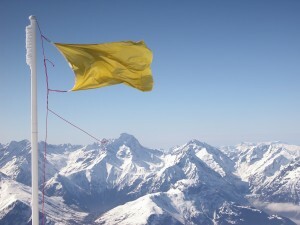 I just want one so I can stand on the top of a mountain and plant my revision flag. I love the revision flag. I LOVE revision. *sigh* But if I spend too much time blogging here, it will take me further away from the day when I’m shoving that flag…well…you get the idea. Which do you prefer, drafting or revision? Do you write at a steady clip or are some areas of your process more lucrative than others?